Move the cursor to a face and the name will be revealed. 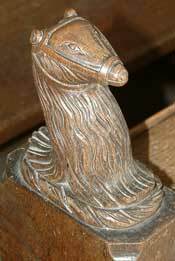 To return to this home page click on the muzzled bear - the Brereton crest. This web site has been prepared by Michael Sandford. Queries welcome! so please make contact and seek permission if you wish to use anything. acknowledgement and a link will be likely all that I ask for! If it is someone else's work then I will put you in touch so you can ask.